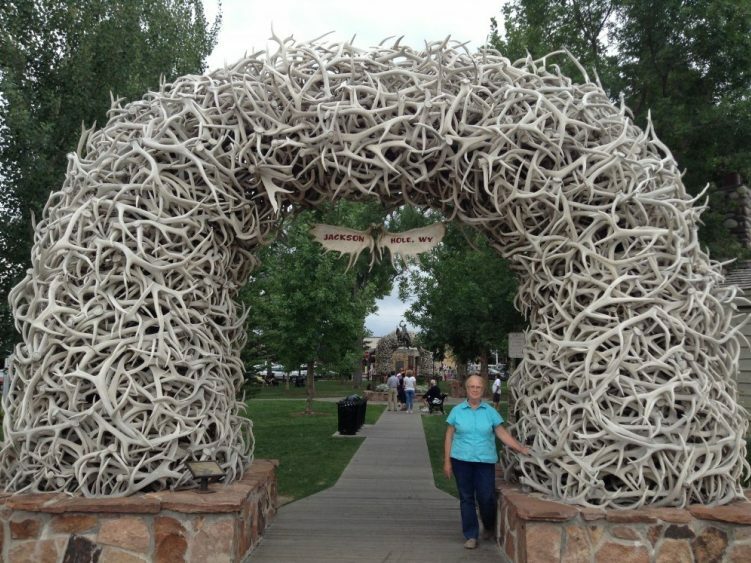 Now I know why they call it Jackson HOLE! Oh my word! The town is surrounded by mountains, right in people’s back yards! It’s really cool—totally flat, and then whoop— 45º angled mountain! We had fun walking around town and fixing supper in a local park. We also met another stealth camper there, who told us about dispersed camping in the national forests. We may look into that as we travel. The city is often called Jackson Hole, but that title actually refers to the entire valley running along the eastern edge of the Grand Tetons. There are mountains all around it, but the tallest ones, with year-round glacier ice, get the most attention. Jackson is the city at the southern end of the Grand Teton National Park, and is obviously a great skiing area. Not being of that persuasion, and it being the wrong season, we just took a walk around the city, looked at the antler gates, and walked through the historic Wort Hotel, built in 1941, before settling down for the night in our usual manner, on a quiet side street. Art was awakened during the night to voices outside our van, and woke me up to stop my snoring. I think there were folks outside looking at the Perseid meteor shower, which occurs each year around the date of our wedding anniversary, August 13. We didn’t dress and join them, though, just tried to get back to sleep. We were really tired. We continue to enjoy the best hotels in the nation, but we don’t sleep there, we just look around, and with our savings, we could even eat in their restaurants, which we did at Old Faithful Inn. The Wort would have cost us $350-450 a night, and we got to walk around it for free! There were a lot of interesting historic photographs, and we even got to see the “silver dollar bar” which has 2032 silver dollars from the Denver mint imbedded in its surface. Seeing remnants of the Old West, and driving across the many miles of arid landscape remind us of the courage and fortitude of those early settlers. We consider ourselves deprived if our air conditioning goes out. They rejoiced if they were able to cover eight miles in a day, and often couldn’t even find water! I wonder what we could accomplish if we worked as hard as they did.